The Oki MC342w is a reasonably priced multifunction printer with built-in wireless capability and faxing for more efficiency. With the Oki MC342w A4 colour multifunction printer, users won't have to buy separate equipment and they can save money and space. However, its overall performance and lack of further expansions can compromise the overall efficiency of the MC342w colour laser printer. The simplistic, universal design of the Oki MC342w printer makes it suitable for use in contemporary to industrial office environments. It has a robust LED engine that minimises energy consumption, and it's powered by a 533MHz processor running on 256MB of RAM. The control panel is conveniently positioned along the 427mm width of the machine and it has one-touch operational keys, an alphanumeric keypad, a blue backlit display screen, and navigational buttons. PC connection is via a USB 2.0 port, while network connectivity is through an Ethernet port. The overall paper capacity of the MC342w laser printer is 350 sheets, with two trays and a 50-sheet RADF. Monochrome output can be printed quickly in speeds of 20ppm. Up to 200 pages can be stored in the fax memory, while 20 groups and 100 speed dials can be saved. The Oki MC342w colour LED laser printer supports PCL/PS emulations and there is built-in RADF and auto duplexing to help save resources. 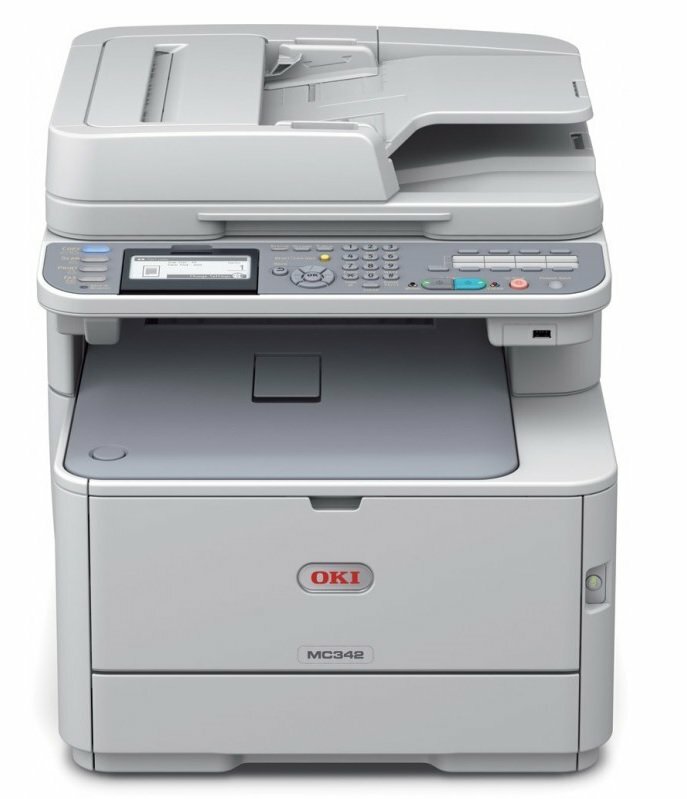 Mobile printing is compatible with the Oki MC342w colour MFP because of Wi-Fi capability. A three-year warranty is provided for this machine's parts. The memory is expandable to 768MB. Recycled Oki MC342w toner cartridges are often used in this device as a cheaper alternative to Oki toners and can reduce the cost-per-print. Sluggish colour printing in the Oki MC342w all-in-one laser printer can compromise productivity for creative users. More installation space is required by the Oki MC342w MFP because of its length and the front-loading paper trays. Only up to five users can be connected to the device because of the outdated processor and limited expansions for the memory.